I took a tour of the new barn Saturday afternoon, and guys...I'm kicking myself for not moving sooner. Ya'll are gonna get all kinds of tiny website photos on this post since I didn't want to be creepy taking photos on the tour yesterday. In all the best ways, it's just like what I have now, only it took me EIGHT MINUTES to get there from my house. I could go to the barn 7 days in a row and my total drive time would be just slightly longer than a single trip to my current barn. - Only two other boarders, total of four horses. One is my age (and is the BO, technically) and the other is a retired woman who comes out and toodles on her half Arabian, and also does stalls and feeds occasionally. - They are perfectly set up to accommodate Connor's weirdness about catching thanks to a very intentionally laid out facility. All the stalls have dutch doors on the backside that open into a sacrifice area with nice footing, and that then opens into the turnouts, so they usually let the horses walk into their stalls. The only person that will have to deal with my hard to catch horse is me - and even then they have "more pastures than horses" so if I do want private turnout, it's no big deal. - They still feed Tribute, which Connor is currently on. - They use Connor's previous vet, who I have no problems with (although I do love my current vet, a fellow eventer). - They don't allow kids, and they don't enforce their posted rules (like hours) with responsible adults, just like my current barn. - There's enough room in trailer parking that I might be able to leave my truck there too, which would be awesome since we really don't have room for it at my downtown house. I may even be able to leave it there and hitched on days I know I need to make a quick exit to a lesson, since I can drive the Vibe there and switch vehicles. Indoor. BO found out I was a Dressage rider and offered to let me put up letters. - He'll be 20 minutes from the Hoosier Horse Park, and an hour closer to the Kentucky Horse Park. To top it all off, I really hit it off with the BO too, and I feel nothing but good about this decision. April 30th can't come soon enough! Wow. I don't think given the commute, facilities, and people this can be anything but a great move for you and C.
Me too! It would have been awful if it was an 8 minute drive and then the facility or people sucked. Yay! Sounds super perfect for you and Connor! Thanks, I think so too! Fingers crossed. Oh my goodness! So many good things all in one post!! It really is almost 100% positive. Yes! And I'll be able to do my own blanket changes. Seriously can't wait. Fingers crossed it ends up being as good as it seems like it should be! My whole world is about to shrink what with working from home and the barn only being 3 miles away! I feel ya! I sometimes realize I have no groceries because it's three minutes to the barn and like fifteen to the grocery so..... Lol! Your horses are in your backyard how could you be jealous?! Haha. That is amazing! It sounds (and looks) seriously lovely. And 8 minutes from your house??? Incredible. Thanks! Yeah, it doesn't get much better than that. What a cool set up for the stalls! I thought so too! I can't wait to do an actual barn tour. I have heard that designing and building this barn was this girl's high school senior project, so it makes sense the details were really carefully thought through. I am so happy for you I have this creepy delighted grin on my face as i read this post. It all sounds so awesome, don't worry April 30th will arrive before you know it. Time deffo flies! Awww, thank you! I hope it does fly! It really is. Lovely purpose built barn. Yeah, I can't believe I haven't done this sooner, looking back. The commute is awful. This looks AMAZING!!! So excited for you! You doing IDS schooling show? I don't know. :-( I want to but it's my husband's birthday weekend. So torn! Are you? Whether I do or not you're welcome to stay the night. He'd be thrilled to have you back and cook for you, even on his birthday, haha. That place looks amazing. 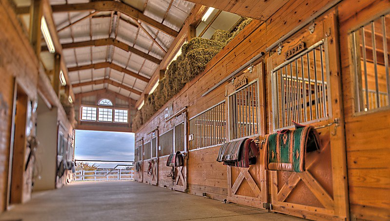 I can't believe they have such a huge barn/indoor with so few boarders. Ironically, it exists basically for the same reason my current barn does. Wealthy father with a daughter that's seriously into horses. The boarding/training wasn't really the point. The new barn doesn't even really advertise or try to make it a business. Wow this sounds so perfect for you!! Yes! Fingers crossed it ends up being as good in practice as I think it will be. Awesome!! So excited for you. Exciting! Looks like a wonderful place. Yay! I'm excited for you!! Yay!! I'm so happy for you and really glad that it feels like a good fit. I can't wait to hear about the move and see even more pictures. Looks beautiful and sounds like a wonderful place! Excited for you and Connor!